Martwayne | Power Through Fashion: "How to GET the Funds You Need to Start Your Own Clothing Line" - The Theme for FEC 5! 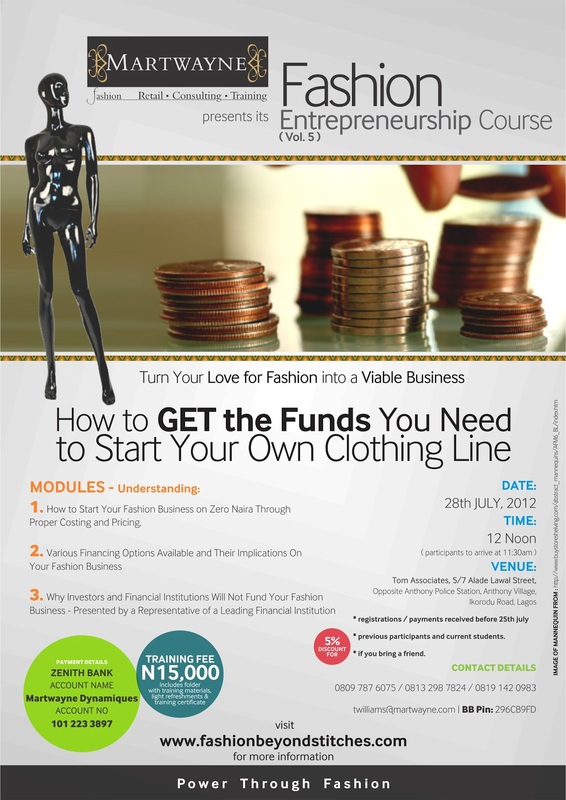 "How to GET the Funds You Need to Start Your Own Clothing Line" - The Theme for FEC 5! So yes this is that we're talking about this month! @ FEC 4, we figured out how to go about producing our clothes. Clearly we now need the funds to actually get the garments on ground and THAT is what exactly we're discussing @ FEC 5. Yeah yeah... I know what you're thinking. Yet another boring seminar on raising funds. I feel you too. But guess what?! This is anything BUT that! Anyone who has attended our FECs will tell you our courses are different. I always believe talk is cheap if you don't assist people or point them in the right direction. But has it ever crossed your mind that whilst people are searching desperately for funds, others have people approaching them to invest in their businesses. I know a friend who is constantly getting offers from investors and I'm thinking to myself and asking him "how is it possible?" Clearly it is because he is doing something right. Whilst searching for a guest facilitator for FEC 5, I met with a few top people in banks and investment firms and what they told me just reminded me of what the invited fund managers and potential investors told me after they attended Designers Connect. They would not invest or provide funds to start up companies, least of all fashion businesses simply because we do not get our acts right! In fact, even I thought I had done my homework very well until I met with a Vice President of a finance corporation about 2 weeks ago and a few questions later, I realized I wasn't ready to approach real investors. I needed to go back and do more work if I stood a chance. Truth is, if you do your homework very well, you just might realize you don't need any serious investment in the early days depending on your plans for your fashion businesses. Your customers can fund your business. I know if I had taken an interest-bearing loan in the past, I'd have been in a mess now. I'm so glad I didn't. A good friend once told me "people don't invest in ideas and visions... (well except angel investors), people invest in business processes." So the key is not taking it personal when you hear no, though it may be discouraging, the key is ensuring you get to work and do what is necessary to get the investment you require... i.e. if you require it at all. And part of this preparation is getting the necessary knowledge required to ensure you stand a very high chance of getting the funds. Knowing what investors and financial institutions look out for would help you package yourself properly to give them no reason to say no! Hi... This a really great post... I have nominated you for the liebster award because I think you deserve it! Check out the detail on my blog. Oh wow! Thank you so much! I feel honoured. I've checked out your site and boy... those questions of yours are like JAMB questions. But I will respond to them. Many thanks and have an excellent weekend ahead!